(Nanowerk News) Johns Hopkins biomedical engineers, working with colleagues in Korea, have produced a laboratory chip with nanoscopic grooves and ridges capable of growing cardiac tissue that more closely resembles natural heart muscle. Surprisingly, heart cells cultured in this way used a “nanosense” to collect instructions for growth and function solely from the physical patterns on the nanotextured chip and did not require any special chemical cues to steer the tissue development in distinct ways. The scientists say this tool could be used to design new therapies or diagnostic tests for cardiac disease. The device and experiments using it are described in this week’s online Early Edition issue of Proceedings of the National Academy of Sciences. The work, a collaboration with Seoul National University, represents an important advance for researchers who grow cells in the lab to learn more about cardiac disorders and possible remedies. 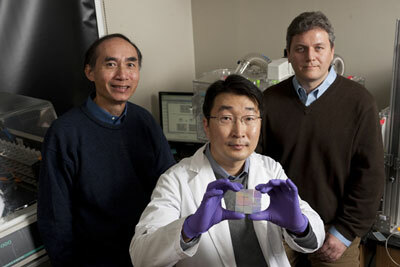 Leslie Tung, left, and Andre Levchenko, right, both of the Department of Biomedical Engineering, with Deok-Ho Kim, a doctoral student in Levchenko’s lab, who holds a nanopatterned chip able to cue heart cells to behave like natural heart tissue. Levchenko said that when he and his colleagues examined the natural heart tissue taken from a living animal, they “immediately noticed that the cell layer closest to the extracellular matrix grew in a highly elongated and linear fashion. The cells orient with the direction of the fibers in the matrix, which suggests that ECM fibers give structural or functional instructions to the myocardium, a general term for the heart muscle.” These instructions, Levchenko said, are delivered on the nanoscale—activity at the scale of one-billionth of a meter and a thousand times smaller than the width of a human hair. Levchenko and his Korean colleagues, working with Deok-Ho Kim, a biomedical engineering doctoral student in Levchenko’s lab and the lead author of the PNAS article, developed a two-dimensional hydrogel surface simulating the rigidity, size and shape of the fibers found throughout a natural ECM network. This biofriendly surface made of nontoxic polyethylene glycol displays an array of long ridges resembling the folded pattern of corrugated cardboard. The ridged hydrogel sits upon a glass slide about the size of a U.S. dollar coin. The team made a variety of chips with ridge widths spanning from 150 to 800 nanometers, groove widths ranging from 50 to 800 nanometers and ridge heights varying from 200 to 500 nanometers. This allowed researchers to control the surface texture over more than five orders of magnitude of length. “We were pleased to find that within just two days the cells became longer and grew along the ridges on the surface of the slide,” Kim said. Furthermore, the researchers found improved coupling between adjacent cells, an arrangement that more closely resembled the architecture found in natural layers of heart muscle tissue. Cells grown on smooth, unpatterned hydrogels, however, remained smaller and less organized, with poorer cell-to-cell coupling between layers. “It was very exciting to observe engineered heart cells behave on a tiny chip in two dimensions like they would in the native heart in three dimensions,” Kim said. Collaborating with Leslie Tung, a professor of biomedical engineering in the Johns Hopkins School of Medicine, the researchers found that after a few more days of growth, cells on the nanopatterned surface began to conduct electric waves and contract strongly in a specific direction, as intact heart muscle would. “Perhaps most surprisingly, these tissue functions and the structure of the engineered heart tissue could be controlled by simply altering the nanoscale properties of the scaffold. That shows us that heart cells have an acute ‘nanosense,’” Levchenko said. Looking ahead, Levchenko said that he anticipates that engineering surfaces with similar nanoscale features in three dimensions, instead of just two, could provide an even more potent way to control the structure and function of cultured cardiac tissue. In addition to Kim, Levchenko and Tung, authors on this paper are postdoctoral fellow Elizabeth A. Lipke and doctoral students Raymond Cheong and Susan Edmonds Thompson, all from the Johns Hopkins School of Medicine Department of Biomedical Engineering; Michael Delannoy, assistant director of the Johns Hopkins School of Medicine Microscope Facility Center; and Pilnam Kim and Kahp-Yang Suh, both of Seoul National University. Tung and Levchenko are affiliated faculty members of the Johns Hopkins Institute for NanoBioTechnology. Thompson is a member of INBT’s Integrative Graduate Education and Research Traineeship in nanobiotechnology. Funding for this research was provided by the National Institutes of Health and the American Heart Association.